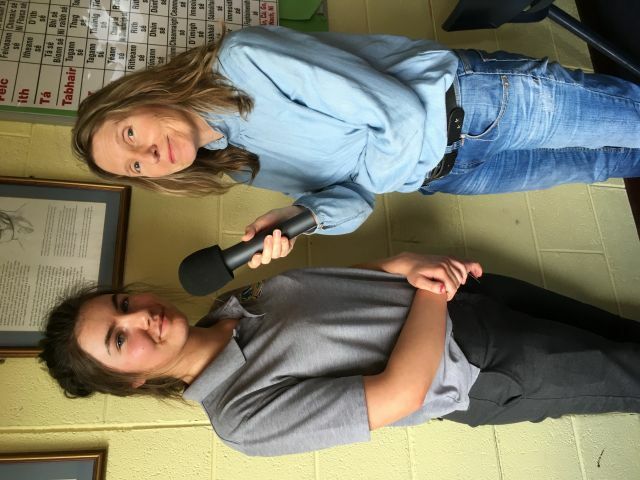 On Thursday 9th January, Radio Kerry came to our school to interview us about the water explorer competition. They found out about this competition in the Kerryman as we had previously written an article about the competition for the newspaper. I was interviewed and I spoke to them about the 4 different areas of the challenges, Fresh water, Secret water, Global water and Precious water. They were extremely interested in our recent trip to our local river the River Maine where we performed a pollution experiment. The biochemical oxygen demand experiment is used by scientists as a measure of how clean or polluted water is. Our results told us that the water is relatively clean with some treated effluent present. This links to the presence of mayfly which is a biological species found in clean water. We collected these in our sweep nets on our visit to the river. I explained that we are still working on this challenge as we are finishing our write-ups. ‘Don’t be a drip, save every drop. Much an sconna’. The representative from Kerry Radio was delighted that our school is doing so well with our various challenges and are interested in keeping track of how we progress in the competition.